Progressive Chat: Hillary Campaign has a new app and podcast! Hillary Campaign has a new app and podcast! Hillary Clinton might be namedropping Pokémon Go on the campaign trail, but she'll also be hoping her supporters have some smartphone battery left for another app — her own. 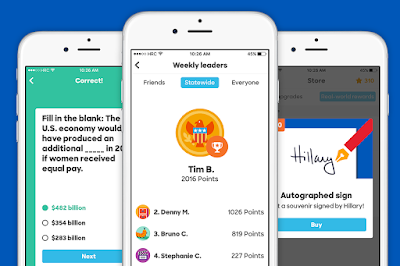 Clinton supporters Hillary for America launched Hillary 2016 on the App Store last night, an app that offers daily challenges and quizzes to Clinton supporters, as well as providing digital and physical rewards to volunteers who help organize and canvas for the Democratic candidate. Users can open their own digital headquarters and change its design and layout, moving desks, chairs, and giant American flags around ahead of the election in November. Clinton supporters will be able to compete against each other at local, state, and national levels to gauge who's working hardest for Hillary, with scores increased by activities like signing up to receive texts from Hillary's campaign. Get enough stars and you'll also be able to get physical rewards, like having something signed and sent to you by Clinton herself. The app's only out on iOS, with an Android version still in development. The campaign has also launched a podcast - With Her. It's an inside look at the campaign and what it's like to run for president. Ever wonder what’s it like to be on the road to history? Running for president is a big deal, but on With her, you’ll hear from Hillary Clinton, Tim Kaine, their supporters, and staff about the little details from the campaign trail they’ll never forget. It's got great content, quality and is a short and fun listen. So go subscribe in a podcatcher near you.